If you create themes out of HTML templates often, you probably know how boring it is to convert assets like <link href="css/some-style.css" rel="stylesheet"> or <script src="js/script.js"></script> to proper WordPress enqueues. It makes you wonder why spending 5-10 minutes of copy/pasting and modifying a few dozens of lines of code when you can spend 1-2 hours to create a simple generator that automates the process (and then, spend less than a minute for the same job on each future project). Assets to Enqueues Converter is that simple generator which allows you to batch convert such assets. 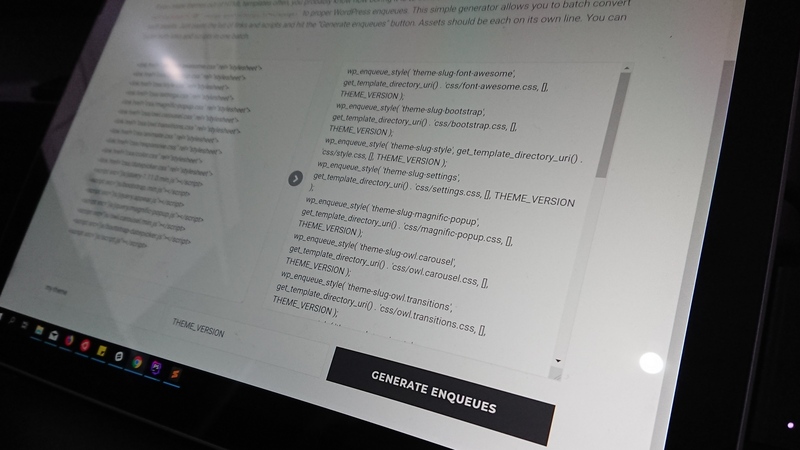 Just paste the list of links and scripts and hit the “Generate enqueues” button. You should put each asset on its own line. You can paste both links and scripts in one batch. If the asset is a link, it will use wp_enqueue_style() , if its a script, wp_enqueue_script() .